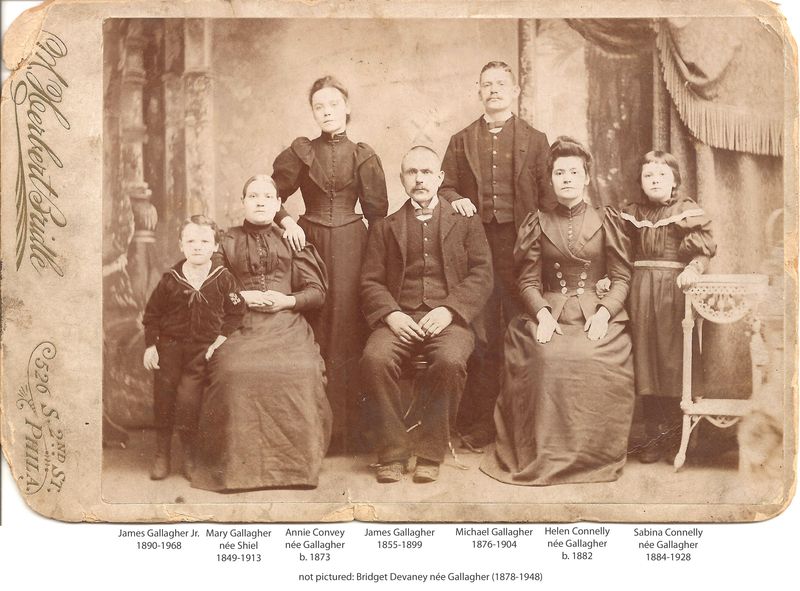 James Gallagher was born near Swinford, Co. Mayo, probably around 1855, to Anthony Gallagher. James’ exact date of birth isn’t known, and dates vary from document to document: the 1891 England Census and immigration records suggest he was born in about 1847, while his death certificate suggests 1855. 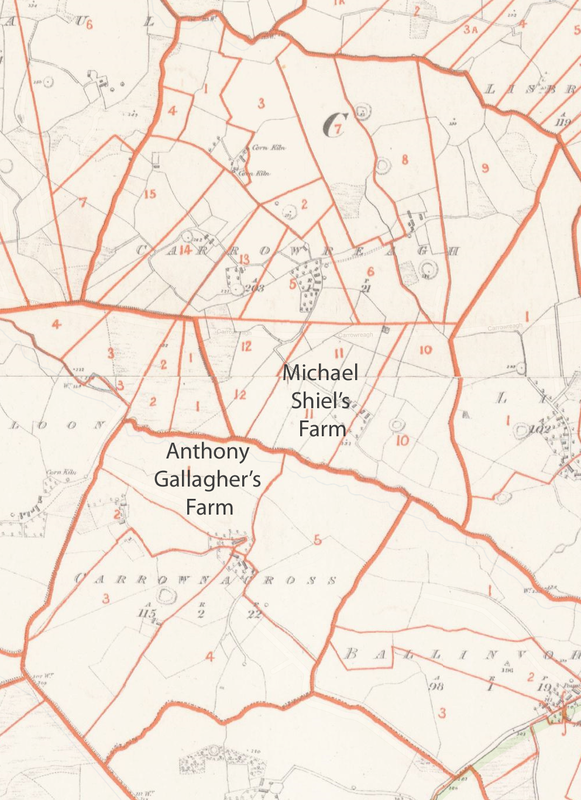 Learning much about his parents is challenging: there is a 23 March 1897 death certificate for an Anthony Gallagher from a Renany townland (probably Rinnaney) just north of Foxford, which is about eight miles northwest of Swinford. James’ marriage record notes he was living in Carrownacross, just west of Swinford, and 11 miles from Rinnaney. Griffith’s Valuation does show an Anthony Gallagher leasing land in Carrownacross in 1856. Assuming this is our Anthony Gallagher, he was about 80 when he died of bronchitis, pointing to a birth in the late 1810s. This would put Anthony in his 30s when James was born. Unfortunately, there are quite a few parcels of land in Griffith’s Valuation rented to Anthony Gallagher near Swinford, and while one man could lease multiple tiny properties, it’s quite likely there is more than one Anthony Gallagher of the same generation. Mary B. Shiel was born near Swinford, Co. Mayo sometime between 1844 and 1857 to Michael Shiel and Bridget Kennedy. Like James, her exact date of birth isn’t known for sure as multiple sources list different ages. A 1901 census record showing a Michael (72) and Bridget (68) Shiel living in Clooncarha townland, which is about 20 miles east-southeast from Carrowreagh and Swinford. A 4 December 1903 death record for Michael Shield in Clooncarha, reported by his widow, Bridget. 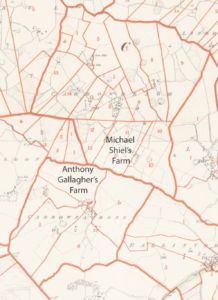 Of course, Michael and Bridget are common names, and there was a Michael Shiel listed in Griffith’s valuation in Kilmovee, adjacent to Clooncarha, in 1857. James and Mary’s marriage certificate lists their fathers’ names, and that they lived, respectively, in Carrownacross and Carrowreagh townlands. Griffith’s valuation shows that in 1856–shortly after both were born, that Anthony Gallagher rented a farm in Carrownacross, while Michael Shiel leased one in Carrowreagh. Looking at the detailed maps, the two men lived immediately adjacent to each other, suggesting that James and Mary probably knew each other from birth. On 26 April 1871, James and Mary were married at Swinford Chapel. Both were listed of age. In attendance were Patt and Ellen Shiel—probably Mary’s relatives—as well as one B. Durcan, who appears at the wedding of Ned Devaney and Catherine Higgins a decade later (Bridget Durcan is a frequent name at Swinford weddings of the period, so perhaps she was a clerk or otherwise assisted the parish priest). James and Mary had thirteen children together, but only six survived into adulthood. Anna (b. 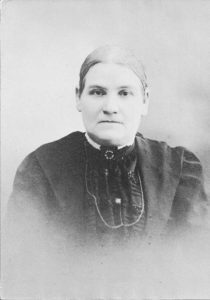 1876), who married Martin Convey and had six children. Michael P. Gallagher (1876-1904), who did not marry and died at age 28. Delia (1878-1948), who married Michael J. Devaney and had one child, Mary Josephine Devaney. Ellen G. (b. 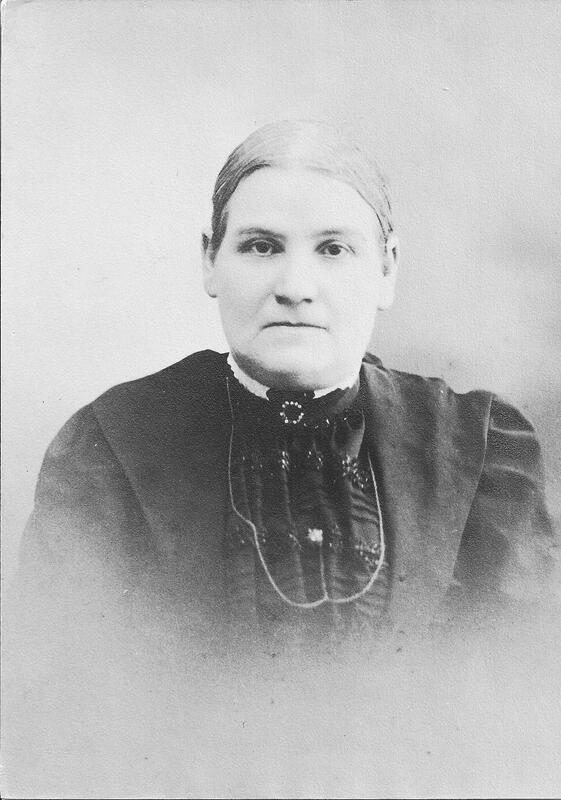 1882), who married Patrick Connelly and had three children and at least seven grandchildren. Sabina A. (1884-1928), who married Edward Connelly (Patrick’s brother) and had five children. Sabina died giving birth to the fifth. Just one of her daughters had seven children herself. James Jr. (1889-1968) who married Bridget Callahan. The couple had two children and fifteen grandchildren. I can’t find an 1881 census record for the Gallaghers, but Delia’s baptismal certificate shows they were living in Smethwick, England in 1878. The 1891 England census reports that Michael and Annie were both born in England as well, so James and Mary must have moved to Smethwick shortly getting married. They remained in England for the next few years, but Mary at least must have returned to Co. Mayo, as she gave birth to Sabina there in June of 1884. Why leave Ireland? In The Irish Americans: A History historian Jay P. Nolan described a complex land rental/inheritance scenario operating in Ireland in the late 1800s. Traditional Irish inheritance patterns gave each son a portion of his father’s land upon his death (partible inheritance), which resulted in increasingly smaller parcels of land as the Irish population exploded in the 1700s and 1800s. While few Irish owned their land, instead renting from an Irish/English peer, leased lands followed much the same pattern. English taxes, however, penalized landlords who leased small parcels by setting a minimum taxable rate. The result: landlords began to look for excuses to evict tenants with small parcels. The Irish responded by trying to follow primogeniture, which left younger sons without the opportunity for a living (or a family). James’s father, Anthony, was in his 40s when James was born. While we don’t know how many other children (let alone sons) that Anthony had, James was assuredly one of the youngest. James and Mary ran a shop in Swinford for a few years, but stability meant leaving Ireland to seek work abroad. On top of that dynamic, the civil unrest in Ireland that began in 1870 after the passage of the First Irish Land Act—dubbed the “Land War”—increased economic uncertainty. America was the obvious choice, but the Panic of 1873 sent the U.S. economy into a five-year depression. The Long Depression from 1873 to 1879 was worldwide. Ireland’s agrarian economy was hit hard: grain from the United States was cheaper than Irish grain, while new refrigeration technology enabled low-cost New Zealand and Australian meat products to undercut locally-raised livestock. One country largely escaped the economic devastation: England. While the Gallaghers had already moved to England by 1879, the mini-famine (An Gorta Beag) that hit their home province of Connacht that year must only have reinforced the wisdom of their decision to leave home. According to the birth certificate of their youngest son, James Jr., the Gallaghers lived in Oldbury—a municipality which is now part of Sandwell in the West Mid-Lands—in March of 1890. The address appears to be 46 Moore Street (there is a Moore Crescent today, but not a street). James Sr. was employed as a laborer at an aluminum factory. We have record of the Gallaghers in the 1891 England Census: the family is listed as living in a four-room house at 212 Stone Street in Oldbury. Delia, who would have been thirteen years old, isn’t listed with her family in the 1891 census, and there are no solid candidates for her anywhere else in the census, whether as guest or inmate or niece or sister-in-law. She was probably back living with extended family members in Ireland. In August of 1894, James and Mary Gallagher packed their entire family—Anna, Michael, Ellen, Bridget, Sabina and James—and left Oldbury for Liverpool, where they boarded the S.S. Kensington to Philadelphia on 5 September 1894. They arrived on 15 September 1894, telling U.S. officials that they would be staying with a Mr. Collins, possibly also that a sister Mary would be taking them in. (Delia’s grandson, Jim O’Neill, relates that Delia had to take a boat to meet her family for the voyage to Philadelphia). The 1900 census has 50-year-old Mary Gallagher living at 113 Reed Street with all of her six living children. Her husband, James, was not listed, however: Five years after arriving in Philadelphia, on 15 April 1899, he passed away from pneumonia. There’s a story that Delia’s daughter, Mary Devaney O’Neill, told about a family member running such a high fever that they put him in a bathtub full of ice water to bring it down. Instead, the shock killed him. Mary’s future daughter-in-law, Anne O’Neill believes this must have been James Gallagher. The census revealed some other interesting tidbits: the Gallaghers had more than six children. Mary reports she bore no less than thirteen, meaning seven were either stillborn or died very young. Perhaps this explains the five-year gap between James and Mary’s wedding and the birth of their eldest, Anna. It also may explain why Delia was sent to live with her grandparents: add one or two ill children on top of Sabina and James, and Mary could have been overwhelmed. All of the adult daughters are working in 1900: Anna was a “sales lady,” while Delia and Ellen were both dress makers (though Delia had been unemployed for the past three months). Michael’s occupation was illegible (it might say “Agent”), but he had been unemployed for twelve months. Eleven-year-old James was in school; while fifteen-year-old Sabina—who had no occupation listed—may have been helping Mary keep house. On 29 August 1904, death struck the Gallaghers again, this time it was Michael. His death certificate lists the cause of death as “general paralysis.” The term is vague: while he may have been injured and paralyzed in some accident, “general paralysis” was also used to describe dementia which arises in late-stage syphilis. Between 1900 and 1910, several of the daughters married. Anna married Martin Convey in 1902, Delia married Michael Devaney in 1906, and Ellen married Patrick Aloysius Connolly in 1907. In the 1910 census, Mary, 60, is renting a home at 21 8 Reed Street. Living with her are Sabina, 23—who works as a seamstress at a department store—and James, 20—who works as a laborer. Sabina moved out in 1913, the year her mother died, marrying her sister Ellen’s brother-in-law, Edward Joseph Connolly. On 27 April 1913, Mary B. Gallagher née Shiel passed away at 215 Reed Street at the age of 63 from a heart ailment. She was buried in Holy Cross Cemetery near her husband, James Sr. and her son, Michael. In 1902 at the age of 26, Anna Gallagher—a “sales lady” according to the 1900 US census—married Martin Convey, the son of Francis Convey and Maria Murray born in Ballina, County Mayo. Martin probably came to Philadelphia aboard the S.S. Rhynland, which sailed from Ireland via Antwerp and arrived in New York on 1 June 1882. The probably here is a true probably: the handwriting of the immigration agent or ship captain was absolutely and utterly atrocious. The names of the Convey children seem about right, and after a couple glasses of wine, it really looks like a match! Even if the script could be Chancery Turkish and there’s one too many Conveys. Be that as it may, it’s the closest candidate for the arrival date of 1883 which appears in the 1900 US census, and the ages are pretty damn close. According to a Philadelphia City Directory in 1895, Martin, 25 was employed as a stevedore, living at 127 Federal Street close to the city’s wharves. In 1900 at the age of 30, he was working as a longshoreman and living with his mother and siblings at 63 McKean Street, about a mile south of the home on Federal. Somewhere along the line, the County Mayo network had brought Martin and Annie Gallagher together, and they married in 1902 when Martin was 30 and Annie 26. In 1910, the family was living at 216 Reed Street right next door to Anna’s mother, Mary, and her two youngest siblings, Sabina and James. Martin, 40, is still employed at Philadelphia’s bustling port. Sometime between 1911 and 1918, the family moved a block or so over to 120 Emily Street. In mid-September of 1918, the Spanish Influenza hit Philadelphia, and it hit hard: with 12,000 deaths, most falling between 4 October 1918 and 20 October 1918, Philadelphia had the highest death rate of any city in America. Five-year-old Martin Convey was one of the earlier victims, dying on 5 October 1918—perhaps his parents had taken him to the Liberty Loan parade on 28 September 1918, which may have been a major locus for spreading the virus. The reality in Philadelphia might as well have been torn from the pages of Albert Camus’ The Plague. Panic was widespread: all saloons, picture houses, theaters and other forms of public entertainment were closed just a few days after the parade, when the number of new cases in a single day skyrocketed from dozens to over 600. When he was buried two days later, Martin’s Aunt, Delia Gallagher Devaney attended the funeral, but wouldn’t come to the wake held for Martin in the Convey home. Delia was afraid she might contract the illness and give it to her daughter, or to her, nieces or nephews living with her at the time. In the 1920s, daughters Mary and Anna Convey formed a tight bond with their cousin, Mary Devaney—there are several photos of the pair with Mary and her father, Michael Devaney. Anna was one of Mary’s bridesmaids at her wedding in May of 1931. In 1931, Mary R. Convey, 25, married Edwin J. Kelly, also 25. Edwin—the son of John James Kelly and Sarah Cecilia Cannon—probably met Mary through her younger sister, Anna, or via her younger brother John: in the 1930 census, Edwin is employed as a clerk at a department store. Ellen and Sabina Gallagher married two brothers, Patrick and Edward Connelly. Other than their origin in southern County Mayo near or in Claremorris, their family is a bit of speculation. Both brothers mention a sister in Philadelphia upon their arrivals: when Patrick arrives in New York, he states that he is heading to Philadelphia to see his sister, Mrs. McGaffney. When Edward arrives in Philadelphia a year later, he is met by his sister, Hannah. Tracking down Hannah McGaffney hasn’t yielded any results, however. If we have the correct 1901 Ireland Census record for Edward, then he and Patrick had an older brother, Michael (30), who had recently married a woman named Mary Anne (29). The couple had three young girls, Sarah (1898), Delia (1899) and Norah (1900). The 1911 census adds two sons, Patrick (1902) and Michael Joseph (1905). Their father, Michael (60) was born around 1841, and was a widower in 1901. The name of his wife, Mary Bannan, is tenuous at best: Alexander Waugh has a family tree on Ancestry.com with one Sarah Connelly born the same year as our Sarah Connelly, with parents Michael Connelly and Mary Banna, and spouse Duncan McDougall. Patrick Aloysius Connelly was born in County Mayo, Ireland on 31 July 1879 to Michael Connelly and maybe Mary Bannan. Patrick listed his birthplace as Claremorris, but it was probably in the nearby village of Culnacleha where his father, Michael, was a farmer. In 1901 at the age of 22, he was living in Ince-in-Makerfield near Wigan, England as a boarder in the house of Thomas and Elizabeth Johnson at 84 Manchester Road. He was employed as a coke burner, purifying coke to a level appropriate for making steel. He didn’t stay long, though: on 11 March 1903 at the age of 23, he paid for his own ticket on the S.S. Cedric, boarding in Liverpool and arriving in New York City on 21 March 1903. New York wasn’t his final destination, however. He intended to travel south to Philadelphia where his sister Mrs. Gaffney (or Mrs. McGaffney) lived at 1244 Federal Street near Columbus Square in South Philadelphia. He likely connected with the Co. Mayo community in Philadelphia, and four years later in 1907, he had married Ellen Gallagher—they were both 28. Their first child, Edward James Connelly, was born soon thereafter in 1908. On 16 June 1909 at 30, Patrick became a naturalized citizen of the United States. His naturalization declaration states that he was employed as a bartender—just like Ellen’s brother-in-law Michael Devaney—and that he had declared his intention to become a citizen on 12 Nov 1906. Oddly, he lists Ellen’s birthplace as Claremorris, Ireland, rather than Smethwick, England. The 1910 census shows Ellen and Patrick, both 31, living at 2419 S. Clarion Street in South Philadelphia, a mile and a half south of Patrick’s sister, and that they have a second child, Mary R. Connelly. Patrick’s 1918 World War I draft registration card lists him as tall, with brown hair and blue eyes. The war had prompted a change in profession: he was working for the Remington Arms company in September 1918. The job must have been worth the pay, as Remington was based in Eddystone, near Chester—a 10-mile plus commute. The family had also made a big move between 1910 and 1918: they had left their home on Clarion Street in South Philadelphia, and had moved to 45 N. 59th Street in West Philadelphia where they lived in the home owned by Ellen’s sister, Delia Devaney and her bartender husband Michael. In the 1920 census, at the age of 41, Patrick is tending bar again. The couple had a third child, James Connelly, born nearly a decade after the first two. The family had moved again, now owning a home at 5732 Cedar Avenue (Patrick and Ellen may have owned their home at 2419 S. Clarion as well—the 1910 census is a little fuzzy). Patrick didn’t live to give his daughter Mary in marriage, or play with Edward’s children, however. Sometime between 1920 and 1930, he died. Without a death certificate, the only way we know is that in the 1930 census, Ellen is listed as a widow. The family still lived at 5732 Cedar Avenue, but money must have been tight without Patrick’s income. Not only are 22-year-old Edward and 21-year-old Mary working, respectively, as an electrician at a warehouse and a stenographer for an oil company; but even 12-year-old James is employed, working as a meat cutter at a butcher’s shop. Edward Joseph Connelly was born on 4 December 1882 in County Mayo in Ireland to Michael Connelly and Mary Bannan. He was probably born near Claremorris in the village of Culnacleha where his father, Michael, was a farmer. In 1901 Edward (19) was living with his older brother, Michael and his family (wife Mary Anne and daughters Sarah, Delia and Norah). In 1904, Edward made his way southwest to Cork’s port, Queenstown (a.k.a. Cobh) and bought himself a ticket on the S.S. Westernland sailing for Philadelphia on 7 April 1904. He was met by his sister, Hannah, when he arrived on 8 April 1904, and planned to stay with his brother, Patrick Aloysius, at 436 Winton Street in South Philadelphia. Edward is hard to find in the 1910 census, but in 1913, he married Sabina Gallagher, his brother’s sister-in-law. In 1918, Edward’s World War I draft registration card shows the couple renting a house at 2419 S. Clarion Street, right across the street from Patrick and Ellen Connelly. By this date, they had three children, Edward (born 1916), Mary S. (born 1917) and James (born 1918). Edward was employed as a Pile Driver for Snare & Priest at Greenwich Point in Philadelphia’s port. In 1920, they were still at 2419 S. Clarion, but Edward, 38, was employed as a boilermaker at an oil company, and they had a new, 6-month-old baby girl, Sarah. With four young children born within a year of each other, Sabina and Edward had trouble managing the family. According to stories related to Jim O’Neill, Sarah, the youngest, spent some time in the household of another Connelly relative—perhaps with Edward and Patrick’s sister, “Hannah McGaffney.” Delia and Michael Devaney also moved in to lighten the load in the mid-1920s. The Connelly’s had a break from more children after Sarah, or perhaps there were a few deaths—the 1930 census shows no children born between 1918 and 1928. Regardless, the break ended in 1928, when a daughter, Elizabeth, joined the family. Elizabeth lived, but her birth was fatal for Sabina. Delia and Michael—along with their teenage daughter, Mary—remained to help after the youngest Gallagher daughter died. At least, until Michael Devaney learned through the grapevine that Edward was remarrying. As soon as Delia heard the news—just one day before the wedding—she, Michael and Mary moved out. Edward hadn’t waited long before remarrying. In the 1930 census, he was married to Anna Connelly (47) a spinster who had immigrated to Philadelphia from Northern Ireland in 1912. We don’t know exactly when they married, though. Edward must have gone to great lengths to hide his second marriage: there is no record of a wedding between him and a woman named Anna in Philadelphia in 1927, 1928, 1929 or 1930. They must have married in a nearby town, one for which Ancestry.com has not acquired records. Between 1920 and 1930, Edward, 48, had saved up enough money to purchase a home at 2352 N. Cleveland Ave in North Philadelphia. Edward had also moved out of manual labor and was working as a typesetter at a printer’s shop. One would hope this was a move up for Edward financially and physically—his manual labor jobs must have been taxing. But the Depression was in full swing, so it may have been a step down as well. Jim O’Neill relates that his grandparents, Delia and Michael Devaney, took an active role in helping out Edward and Sabina’s three oldest children. Delia was worried about Edward Connelly, Sr., so when Edward, Jr. showed up in the early 1930s and asked Delia and Michael to take him in, she asked her sister, Ellen, to lend a hand. After Edward Sr.—who may have been working in an amusement park—died in the 1930s, his daughter, Mary S. Connelly came knocking at their door. Her brother, James, was soon to follow. Both lived with Delia and Michael until they married. In 1917, James Anthony Gallager (27), married Bridget Callahan, the Philadelphia-born daughter of Irish immigrants. Mary Helena (1919-2002), who married Theodore Trymbiski (1918-1975) and had ten children. In 1921, James became a naturalized citizen of the United States. He listed Michael Devaney as a witness. He had a number of jobs through his life, including as a motorman in 1921, what looks like a “piper” in city employ in 1930, and a hospital attendant in 1940. He passed away in March 1968 in Chalfont, Bucks County, Pennsylvania at the age of 78, the last surviving child of James Gallagher and Mary Shiel.